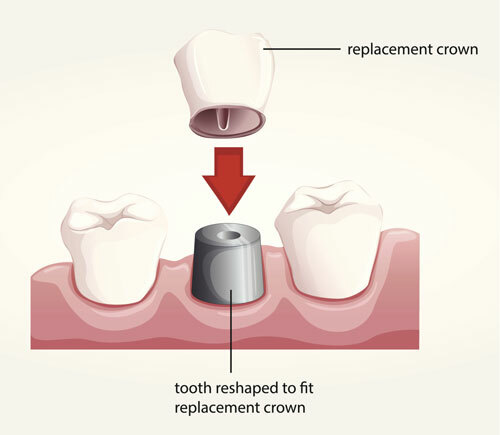 A crown is a custom-created cap that covers the tooth in its entirety, from the gum line to the surface. While you may have heard of a crown in the past, you might not know exactly how they can help the teeth to function better and appear more natural. Find out some of the great benefits of dental crowns to see if this restoration is right for you. Dental crowns can drastically improve the appearance of cracked, misshapen, broken, or discolored teeth. In other cases, if they are attached to a bridge, a crown can replace the tooth altogether, improving your smile. These crowns resemble the appearance of the natural teeth when they are made out of composite resin or porcelain because they mimic the translucency and luster of the natural teeth. You'll be able to restore your teeth and give the illusion of having a natural smile. Unlike dentures and other restorations, you won't need to worry about your dental crowns slipping out of your mouth when speaking or eating. Crowns are either cemented into place over a damaged tooth or anchored into place with a dental bridge or implant. For these reasons, you won't need to worry about the embarrassment that could come from shifting teeth. The best way to ensure that a restoration is going to fit well with your smile is to choose an option that is custom-fitted. Crowns are a great option, as your dentist and a dental lab will design the crown based off of your exact mouth specifications in terms of fit, color, size, and shape. When choosing a crown for your restoration needs, you can feel confident that this individualized treatment option will suit your budget and preferences, leading to a natural-looking final product. A lot of people are under the impression that crowns are a complicated restoration, but in reality, the process of creating them is straightforward and minimally invasive. Once the enamel of your teeth is healthy and clean, your dentist will shape your tooth so that it can best hold the crown, and an impression will be taken to send into the lab. Skilled lab techs will then handcraft the crown so that it can be placed over the tooth with a strong bonding agent. Dental crowns are made out of strong materials, and when cared for properly, they can last anywhere from 15 to 30 years. This regular care involves consistent brushing and flossing along with routine exams and cleanings. Dentists often recommend the use of a dental crown in order to repair damage that has been experienced on the structure or enamel of a tooth. If you have suffered from an infection of the tooth root, extensive decay, or trauma that resulted in a tooth becoming broken, chipped, or fractured, you will likely have an aching mouth. When you choose other restorations like sealing the crack or placing a tooth-colored filling, the remaining portion of the tooth could still be vulnerable to discomfort. Crowns will prevent sensitivity and protect against further issues. Missing teeth can affect your speech, as can dentures that just don't fit properly. The result could be lisped or slurred speech. Plus, your jaw bone could shrink as a result of missing teeth, which would further affect your speech. By restoring missing teeth with a dental crown, you'll be able to speak more confidently. If you're interested in dental crowns to improve the health and appearance of your smile, contact your dental office to set up an appointment.